Joshua W Watson says that two other synths have inspired Shrolca, a new digital wavetable instrument that he’s currently pitching on Kickstarter. 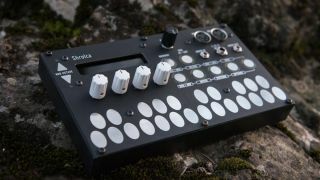 It’s based on the engine of Mutable Instruments’ Shruthi, but offers a similar form factor to a Korg Volca. This is no mere copycat instrument, though. It features digital wavecycle oscillators and sequencers, a modulation matrix and a 24dB voltage-controlled filter. In keeping with the Volcas, you get a touch-activated MIDI keyboard, and the sequencer and arp can also transmit MIDI data. The prototype model you’re looking at has a wooden case, but the production unit will feature a machined aluminium body that’s less than an inch deep. Find out more on the Shrolca Kickstarter page. As things stand, a $250 pledge will get you a synth with an estimated delivery date of October.